I stayed in Friday and let it snow while the apartment manager busied himself shoveling sidewalks. It snowed all day Friday; it didn't stop snowing until 8 o'clock Saturday morning. 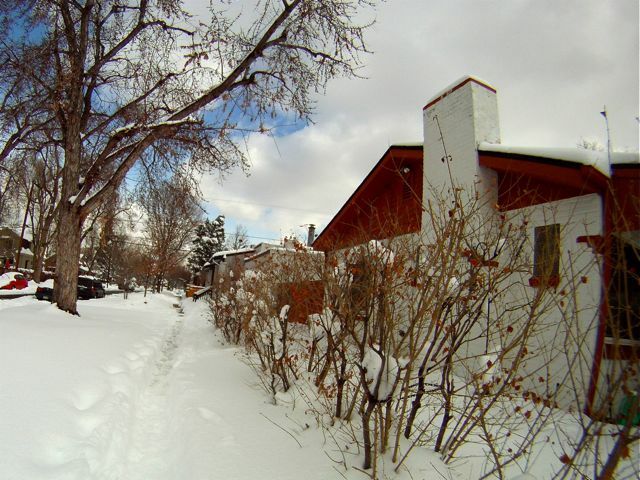 The city of Denver recorded 15.9 inches of snow breaking the February 1912 record of 14.1 inches. It never got very cold. After the sun came out Saturday it warmed enough to melt some of the snow. I went for a walk around the neighborhood in the afternoon. The neighborhood looked to be in good shape. Most people had shoveled their sidewalks, but the streets were still a mess. Walking was easy except when crossing the streets where the gutters had filled with snow and slush. I didn't see any broken tree limbs; the strong wind we had a few weeks ago already took care of that. Some parts of the city lost electricity for a short while, but the apartment never lost power. I had the pleasure of seeing a couple of mountain chickadees up close while on my tour. They didn't stop to pose for pictures, but you can see one of the birds perched in the bush in this picture.